Automatically receive updates on records that matter to you with Feed's Auto-Follow rules. A big deal that could seal your monthly target and requires every bit of your attention. A tough prospect who makes it nearly impossible to close the deal and who makes things harder than it needs to be. Leads generated from a recent campaign that are idle with no activity. Tasks that were due last week but were not completed. Invoices and deals that required extra discounts. This list can go on but the challenge here is, can one keep track of all these? Well, to a great extent you can, with the Auto-Follow rules in Feeds. We know that Feeds can give you updates on the records that you choose to follow but how do you decide which records? 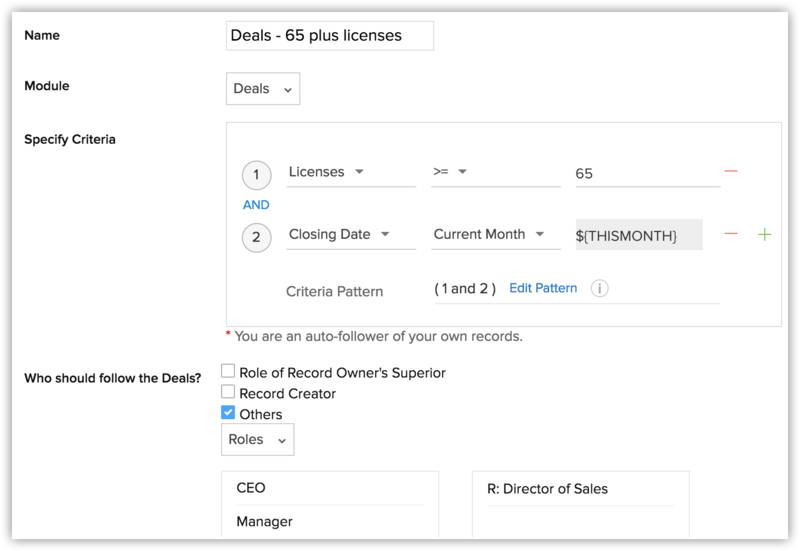 You will automatically get updates for the records that you own, but when you have to follow records that members in your team own, it is not feasible to manually check each record and follow. In that case, you can create Auto-Follow rules where you can specify the criteria. When a record meets the criteria, it is automatically followed by you and you get the required updates in Feeds. Let's take two examples from above. With these rules you can be sure to get updates on the important deals and also the tasks that are overdue or the ones that are differed and need your attention. Make a note that feeds will capture changes to a record that includes creating a record, editing and deleting records, and adding notes. For more information, refer to Collaborate Using Feeds.